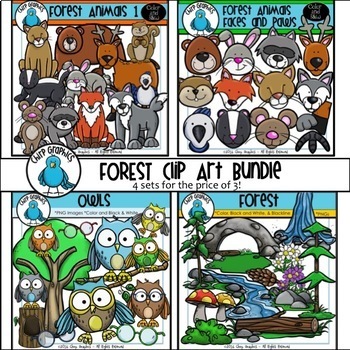 Needs lots of cute Forest Animal and Forest clip art? Save money and buy this multi-pack instead of purchasing individual sets! 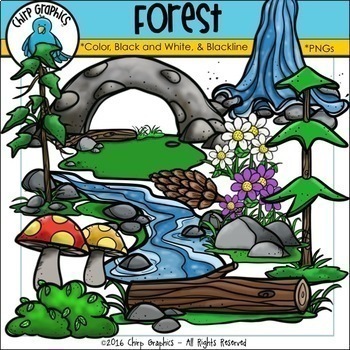 With this huge collection of images including both color and black and white, you'll have everything you need to create some fun forest themed activities AND you'll save $3.95 over buying the items separately! That means 4 sets for the price of 3! Just click on the sets above to see the details of what is included in each product. All of the images are pngs created at 300 dpi on a transparent background. 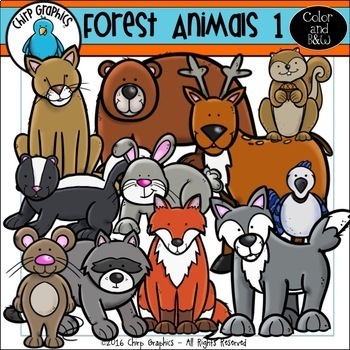 Images may not be given away freely or re-sold as clip art, classroom decor items, or coloring pages, but you may use them on your personal resources, or embed them in the teaching resources that you create to sell on sites like TpT. 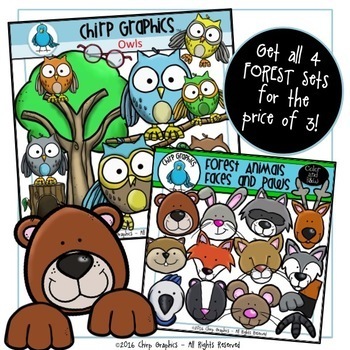 If you use these graphics in TpT resource products, please lock down the images and provide a link to my shop in your product pages.